Hundreds of villagers in eastern China have been demonstrating in recent days against pollution they say is caused by a solar panel factory, with some protesters storming the compound and overturning vehicles, local authorities said on Sunday. 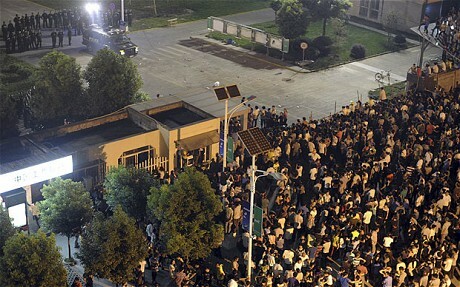 More than 500 villagers in Zhejiang province’s Haining city gathered in front of the Zhejiang Jinko Solar Co. Ltd. factory on Thursday demanding an explanation for the alleged pollution, the Haining government said in a statement. The company is a subsidiary of a New York Stock Exchange-listed Chinese solar company, JinkoSolar Holding Co. Calls to both the Zhejiang company and its parent firm rang unanswered on Sunday. Some of the protesters charged into the factory compound, overturned eight company vehicles and destroyed its offices, the government said. On Friday, demonstrators damaged four police vehicles. Local residents contacted by phone said villagers have protested every night since on Thursday. Video footage posted on the website of the city government’s information office showed that the factory’s windows had been smashed and that dozens of police officers were deployed to the site. It is the latest large protest in China driven by environmental concerns and highlights citizens’ increasing boldness in demanding action from the authoritarian government. Last month, 12,000 residents in the northeastern port city of Dalian protested against a chemical plant after waves from a tropical storm broke a dike guarding the plant and raised fears that flood waters could release toxic chemicals. The massive protests prompted the deployment of riot police and a pledge by local officials to relocate the plant. In Zhejiang, the Haining government said it had asked the solar panel factory to suspend production and that local leaders would soon meet with village representatives. Local police have caught people suspected of theft and vandalism, while a 33-year-old man surnamed Sun has been detained for “spreading false information online” earlier this month about an increase in cancer cases in the nearby village of Hongxiao, the statement said. A 64-year-old Hongxiao villager surnamed Shi said not only does the factory discharge waste water into a river, it also spews dense smoke out of a dozen chimneys. “An elementary school and a kindergarten are located less than a kilometre (0.6 mile) from the plant. My house is only about 500 meters (547 yards) from the plant. Many fish died after the factory discharged waste into a small river,” Shi said in a phone interview. “The villagers strongly request that this factory be moved to another area. I am very worried about the health of the younger generation,” he said. Although the government rarely gives in, a similar environmental protest four years ago in the city of Xiamen was successful. The 2007 protests against a chemical plant led the Environment Ministry to say in 2009 that the factory would be built instead in a less populated area of another southeastern city, Zhangzhou.